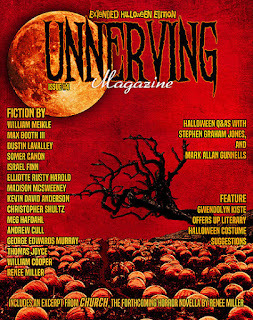 Unnerving Magazine is a relatively new quarterly magazine of horror, dark fantasy and dark sci-fi. It's really dark! So if you love horror and all things creepy then this is the magazine for you. I've read a few issues now and loved everyone of them so far. I also want to point out that Unnerving have a great deal on right now. You can subscribe to this magazine for a whole year for just $10! For that price you get to read some amazing stories and help support indie horror. When I subscribed I got a free ebook called Alligators in Sewers which looks really cool, I can't wait to get stuck into that. 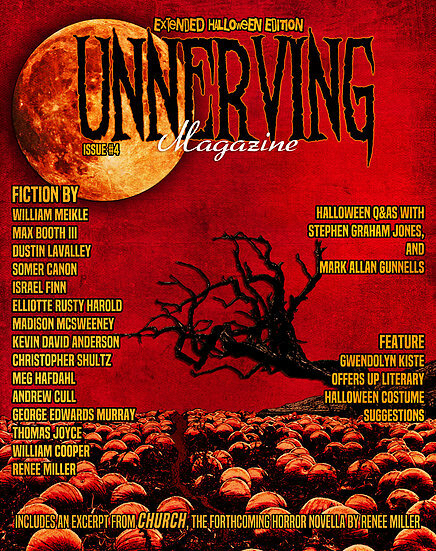 Issue #4 is a bumper Halloween issue and features a really impressive line up including William Meikle, Max Booth 111, Israel Finn and regular contributors such as Gwendolyn Kiste. There are 13 dark tales inside, all themed around Halloween, the best time of the year! The collection starts off strong with Luddid House by Madison McSweeney in which a mother and son go trick or treating in their local neighbourhood where they stumble upon the creepy Luddid House. This was a really dark tale with sinister foreboding switched up to the max! Babysitting for Writers by Kevin David Anderson was a really fun tale about an overworked babysitter who's boss has some unusual extra-curricular hobbies. Boy Takes After His Mother by Max Booth 111 was one of my faves, it's as sweet as it is dark, because even serial killers have soft sides. Black Balloon by Christopher Shultz was a really original and dark quirky tale about a black balloon that infects anyone it comes near. Maximum points to Christopher Shultz for darkness! By the Gun by Thomas Joyce is a great western tale about retribution! A Day at Sea by Israel Finn follow the story of three friends looking to get away from it all for a day and party on their mate's boat. Things don't go exactly to plan. Mud by Somer Canon is another of my favourites. This was a great tale about all things that go squelch! The ending was so cool! Bishop by William Cooper is a really creepy tale of a young boy, Puke, who finds a strange knife and becomes a stranger in his sister's eyes. Me Too by Meg Hafdahl is a tale of two young girls who want to be free of their childhoods and go out into the adult world. But they're just not ready for it yet! Trick by Andrew Cull is a tale of quiet but devastating horror. The events made worse by the lack of the narrator's understanding of just what it is he's done. Really cool! Why I Don't Let My Kids Go Trick or Treating by Elliotte Rusty Harold is another favourite of mine from this collection. It tales the tale of a dad recalling the time he used to go trick or treating with his brother when they were young and why he absolutely forbids his children from doing the same. Staying Alive Among the Beasts by William Meikle is a really dark apocalytic tale of one man, Fred Atkins fighting not just for his survival after an awful event but also for the survival of his beloved animals. Sylvia Spool by George Edwards Murray is a really cool tale that fuses with folklore and horror. It tales the tale of two young girls who wander up to a cave from their village and stumble upon an ancient goddess, Sylvia. Under the Influence by Renee Miller is a really dark tale of a a man and a woman forever changed by an awful tragedy. There's also some really cool articles by Gwendolyn Kiste who offers up some great Halloween fancy dress ideas from the vaults of horror. Dustin La Valley advises us on how to survive a zombie attack without weapons, and there's an interview from horror legend Stephen Graham Jones. You can get your copy here Unnerving also have a great range of dark novellas, limited edition chapbooks and a whole lot more.